PDF security is used to protect PDF documents from unauthorized use and misuse by controlling who can use them and how they can be used. then you must choose a PDF Security product that uses DRM controls and public key technology to sufficiently protect your intellectual property. Locklizard PDF Security locks your protected PDF documents to individual devices (e.g. Windows & Mac computers, iOS & Android tablets) so that they cannot be readily shared with others. A Secure PDF Viewer decrypts protected content in memory (no cache/temporary files are generated with unprotected content) and applies the appropriate DRM controls to enforce document usage. Protected PDF documents can be revoked on-the-fly, document expiry dates can be extended if and when required, and prints limits can be amended at any time. Watermarks with dynamic user information (the PDF document only needs to be protected once for all users) can be displayed on protected PDF documents, so that if printing is allowed and the document is photocopied and distributed to others, the document owner can identify the culprit. Document revocation policies can be easily adhered to by setting expiry dates – once this date has passed documents can no longer be opened. PDF documents are protected locally on your computer (batch mode is supported) and can be uploaded to a web site or sent by email etc. just like any other file. Authorised users install the Viewer software and activate their license file (by clicking on it) in order to start viewing your protected PDF files. Decryption keys are handled transparently by the licensing server and stored encrypted in a keystore locked to the user’s device. There are no passwords for users to enter, forget, or pass on to others. A web based administration system enables you to add/edit/delete users and modify their document access. PDF documents can be protected to publications (document groups) to enable simpler allocation of document access. Locklizard PDF Security can also be used to automate your web sales process with the issuing of licenses and document access – no user intervention is required. 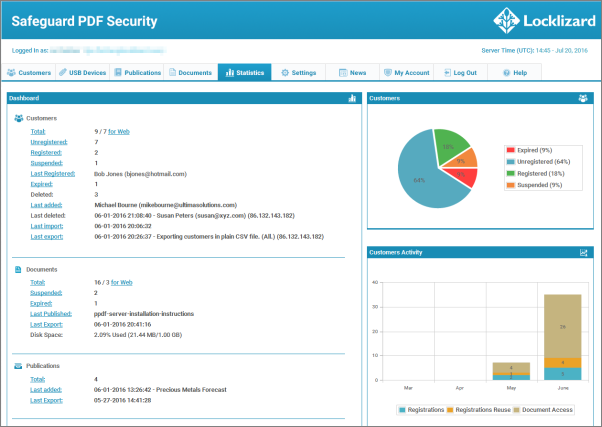 Evaluate our PDF Security software now – FREE 15 day trial.